For optimal flavor, roast beets the day you harvest them. Native to Europe and Asia, the garden beet is related to both Swiss chard and the sugar beet. 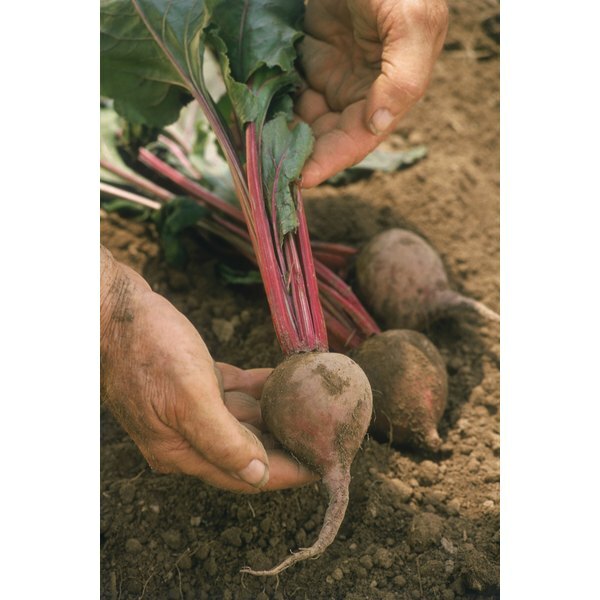 Beets are relatively easy to grow, making them a popular garden vegetable. Roasting beets is an ideal way to cook them to maintain optimal nutritional value. A 1-cup serving of sliced beets has 58 calories, a trace amount of fat, 2 grams of protein and 13 grams of carbohydrates, including 4 grams of fiber. Beets are a good source of vitamin C.
Scrub the beets and trim off any stems and root ends, if necessary. Wrap each beet in aluminum foil. Place all the wrapped beets into the Crock-Pot. Cover the Crock-Pot and cook the beets on high for about 5 hours. Check doneness by inserting a knife into the thickest part of two or three beets. If the knife goes into the center without any resistance, the beets are done. If beets are still firm, replace the cover and continue cooking for about 20 minutes and check them again. Remove the cooked beets from the Crock-Pot. Allow them to cool until they are easy to handle. Then remove the aluminum foil and slip off the skins with the help of a sharp knife. Reheat the beets in the microwave if you want to serve them hot. Refrigerate the beets if you want to use them in a salad. Cook the beet tops as well, if you have them, for two servings of vegetables from the same plant.